Can an express please both the sportfisherman and the cruiser in you? The Scout Abaco 350 says yes. 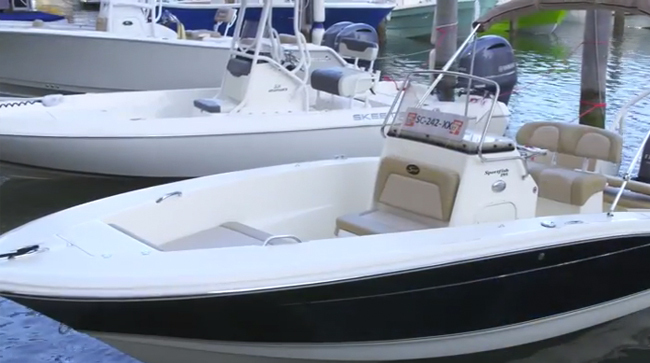 While you might know Scout Boats primarily as a manufacturer of top-end, high-performance center-console fishing boats, you may not know that the South Carolina builder also has a fine lineup of express cruisers geared toward the fishing crowd, including the subject of this boat review, the Scout Abaco 350. I know what you’re thinking: there’s no way an express cruiser can be bent into a fishing boat and do either job well. Normally you’d be right for thinking that, but in this case—well, read on before you make up your mind. 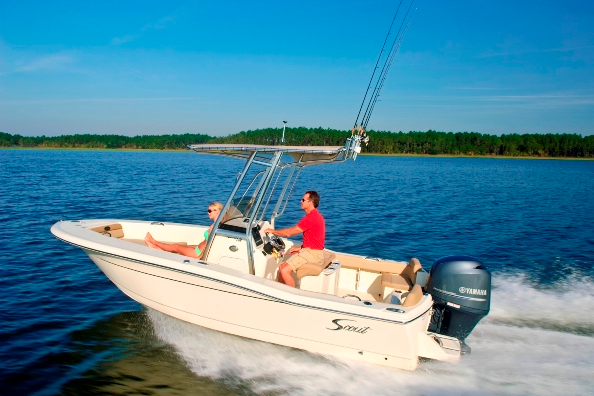 The Scout 350 Abaco goes both ways: express cruiser, and serious fishboat. Truth be told, I’m not much of an express boat guy. If I am going to cruise, I want to do it on something like an MJM 40z or a Sabre 40, and yes, before you say it, both of them are far outside most of our budget and spousal approval envelopes. But my express cruiser views changed when it came to the Abaco 350. The fact that it has a serious bend toward piscatorial activities doesn’t hurt, either. 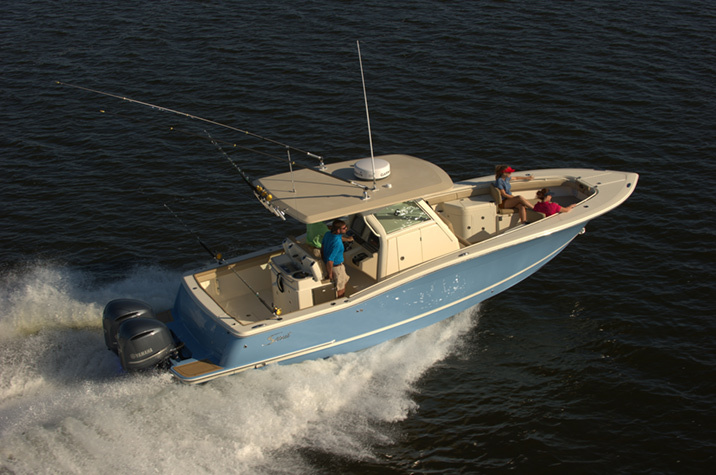 The Abaco 350 sports some traditional Scout design cues including plenty of forward reverse sheer, an angled transom, and distinctive tumblehome. 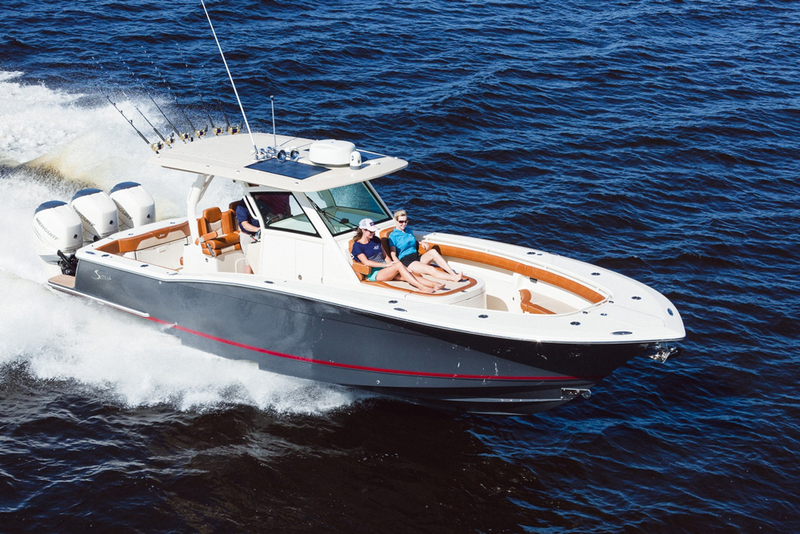 All Scout Boats, including the Abaco 350, are built at the company’s Summerville, SC, plant using all-composite boatbuilding techniques in their hulls and decks—there’s not a splinter of wood used anywhere. The Abaco 350s hull and deck are hand-laid using pre-cut multi-directional fiberglass, as are any modular parts such as seating, exterior cabinetry, hatches, and lockers. The reverse-shoebox hull to deck joint used on the 350 is not only strong, but inherently resistant to water intrusion as well. Scout uses three different hull design technologies, and the Abaco 350 utilizes the company’s stepped hull design, which makes for a fast, fuel-efficient hull on boats this size. While Scout classifies the Abaco 350 as an express boat, her large cockpit was designed with landing the big ones in mind. Need a place to crimp up your tackle and keep your greenies fresh? There’s a rigging station with a large, aerated livewell, deep sink with fresh and salt water supply, and four stowage drawers that open and close with aircraft precision on the starboard side of the cockpit. To port are a 72-quart cooler and 24-quart freezer box for keeping your ballyhoo (and your beverages) crispy cold. Once you’ve caught that big one, pull it aboard through the transom door, and then ice it down in one of the twin fish boxes set into the cockpit deck. 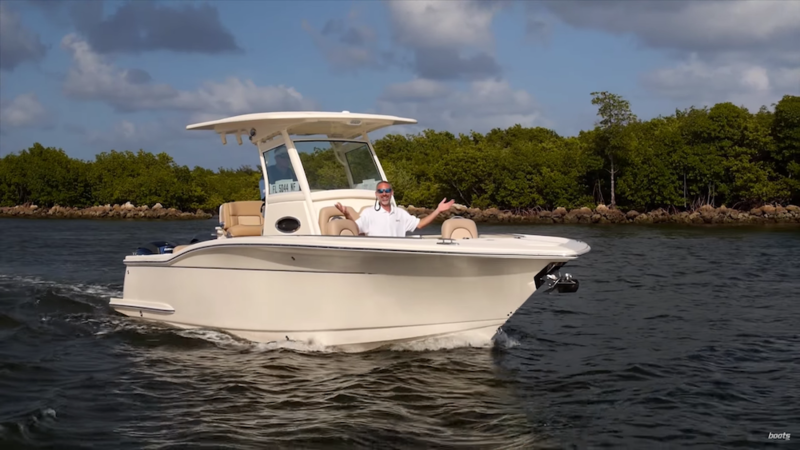 The bridge deck has expansive, air-conditioned seating under an impressive hardtop, and there’s plenty of room for fish-finding electronic gizmos at the richly appointed helm. 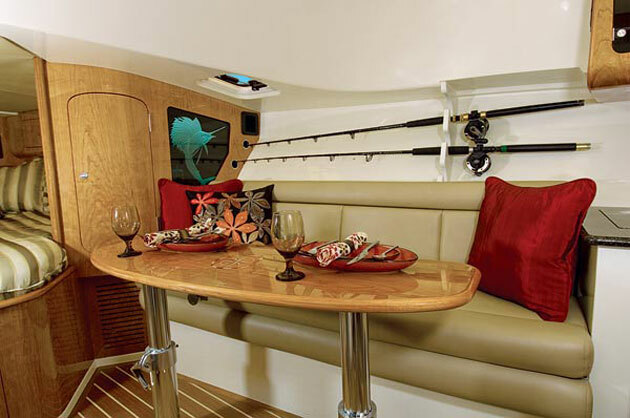 Down below, the Scout 350 Abaco is comfortable yet still displays a fishy attitude. Hop below on the Abaco 350 and you’ll find a luxurious cherry interior with plenty of room (the layout sleeps five), an expansive galley, and an enclosed shower/head. The galley has everything necessary for everything from microwaving a breakfast sandwich to sautéing a fish filet for dinner. Stand-alone, pull-out freezer and refrigerator units are standard. And check out the lighted glass sailfish, etched on the starboard bulkhead. It’s a nice interior, but keep in mind that you’re not going to find a ton of natural light below, and ventilation is limited. If you boat in warmer climes, you’ll definitely be using the standard air conditioning. If you like getting out to the fish fast, or heck, just going fast, then the Abaco 350 will appeal to you. Strapped on the stern of every Abaco 350 are two Yamaha F350 V-8 outboards. This 700-horsepower duo provides 53 mph of top-end speed at wide-open throttle. Equally impressive, however, is the Abaco 350’s ability to cruise at around 30 mph and consume only 27 gph doing it. Think about using only 90 gallons of fuel to get out to the canyons; that’s impressive for a boat of this size. Back it down to trolling speed and you’ll sip just around five gph. 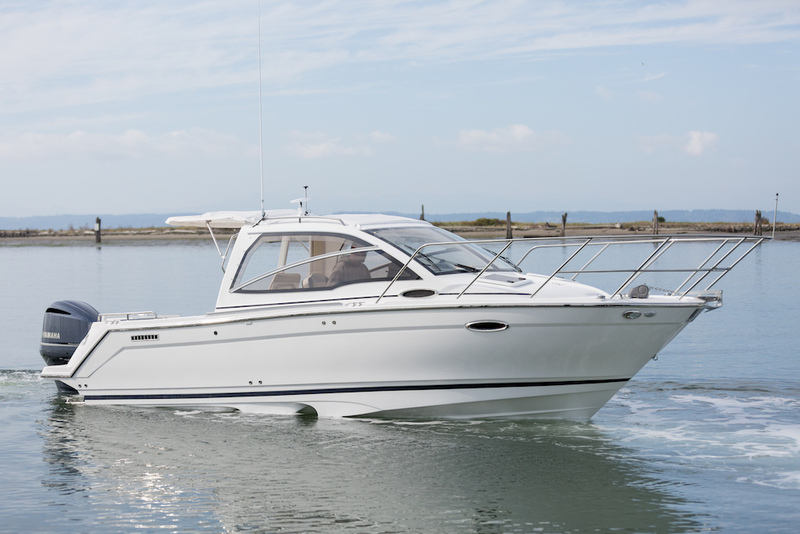 With 330 gallons of fuel on board, that means an excellent fishing or cruising range. Not bad, considering you’re feeding 700 ponies on the stern. 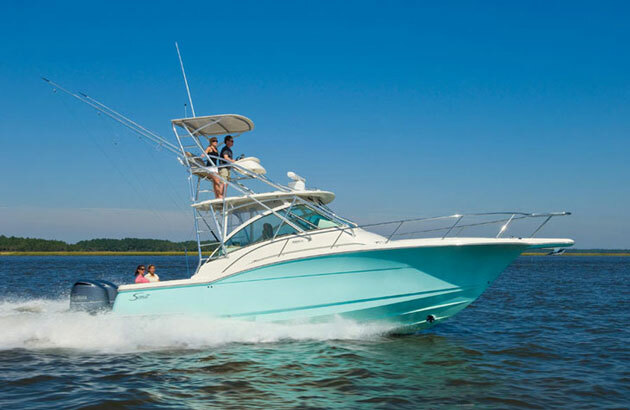 If you’re in the market for a well-equipped fishing machine with innovative features, speed, luxurious accommodations, and outboard power, the Abaco 350 should be near the top of your shopping list. Other Choices: The Grady-White 330 Express also walks the line between express cruiser and fishing boat, with an added emphasis on fishing. An option that leans more towards traditional cruising is the Sabre 38 Salon Express. 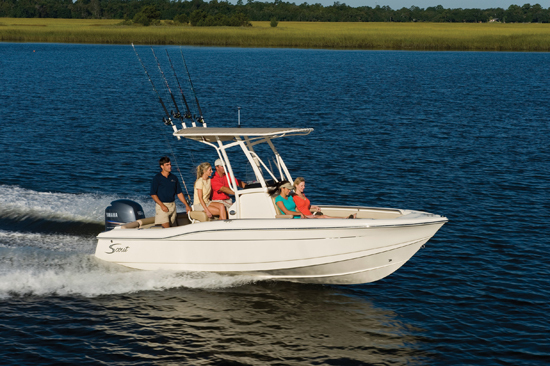 And the Boston Whaler 345 Conquest is a slightly smaller fisher-cruiser. View Scout 350 Abaco listings.